Glass Railings: Can They Increase Your Home’s Value? Take a second to consider all of the valuable things you own. Done? What came to mind first? We’re willing to bet it was your home. People are always looking for new ways to increase the value of their largest asset. A higher valued home means better resale value, opportunities for home equity loans, and a general boost to net worth. The consistent interest in boosting home values has led to many different techniques that work to improve different aspects of a home. There are the usual suspects: curb appeal, kitchen remodeling, a new roof etc., but they only bring your home on par with the rest of the population. Every real estate agent or property appraiser you speak with will repeat these same points. Actually increasing home values by substantial amounts means thinking outside the box. Homeowners need to move away from the old adage of form vs. function. Why have one if you can have them both? Aesthetics that combine form and function are the best way to increase your home’s value in a unique way. Glass happens to fit in this demographic perfectly. Specifically, glass railings provide style and functionality in one package. If your home is functional and beautiful, your property values will soar. People heavily appreciate the surrounding environment when purchasing a home. Common sense says to plant flowers and beautify your property to increase home values. But what use is an elegant yard if it’s obscured by man-made structures? Railings are at best forgotten, and at worst they block breathtaking views. It’s not often someone comes to your home and exclaims about the stunning hand rails you’ve recently installed. Chances are much higher that guests will wonder about such unsightly railings were chosen. Glass railings intend to change that negative stereotype. Handrails made of glass get their beauty from the world around them. They work wonderfully around homes that are already alluring. The translucence of glass means nature isn’t obscured by man-made structures. Homes surrounded by flowers, water, or even just a well-manicured yard can all benefit from glass railings. The ability to highlight nature make glass railings an excellent way to improve your home’s aesthetic value and its monetary value. Glass railings combine the best aspects of a traditional railing with a classy look that highlights stairs instead of hindering them. There’s no denying that glass brings a certain streamlined, modern look to homes. It outlines without being obtrusive and stands out just enough to remind people that the little things matter. What most people don’t realize is that glass can also increase safety. Glass railings are made of something called tempered glass. Tempered glass is just another word for strengthened glass. It is the same type of glass used on car windows. Tempered glass is suitable for homes that border something that’s both visually appealing and dangerous. Homes near bodies of water can use glass railings to protect children from drowning, while also preserving the waterside view. Likewise, homes built onto mountainsides or cliffs will benefit from the glasses’ transparency for sightseeing, and durability for safety. The glass railings are unique in that they don’t sacrifice safety for beauty. People are always willing to pay more for attractive utility. The same tempered glass that makes glass railings so safe also makes them incredibly durable. Think about breaking a car window. Even after enduring rocks bouncing off at speed in excess of 60 mph, car windows still don’t break. At most, they crack. In the unlikely event that tempered glass does break, it still proves safer than normal glass, leaving small pieces of glass as opposed to dangerously sharp shards that could seriously injure someone. This durability translates well to glass railings. The very function of a railing is to keep people from falling off your stairs, and also to provide a handrail. The tempered glass excels in both of these tasks. The glass holds up very well to constant human contact with the railing. The promise of long lasting components can only increase your home’s value. Glass railings also shine because glass is easy to clean. A simple wet rag combined with an hour of your time will have your railing looking good as new. People prefer to picture their new home as a place of luxury. Having the ability to easily maintain their railings will endear them to the home, and increase its value. Glass railings are great to install in any home. So far, we’ve listed specific instances where the railings really thrive. However, this doesn’t mean a glass railing cannot work under the most basic circumstances. The railings work great for mundane areas like your basic outdoor patio. The glass lacks the gaps of traditional railings, making it ideal for keeping kids and pets inside an enclosed area. Traditional staircases also work well with glass. 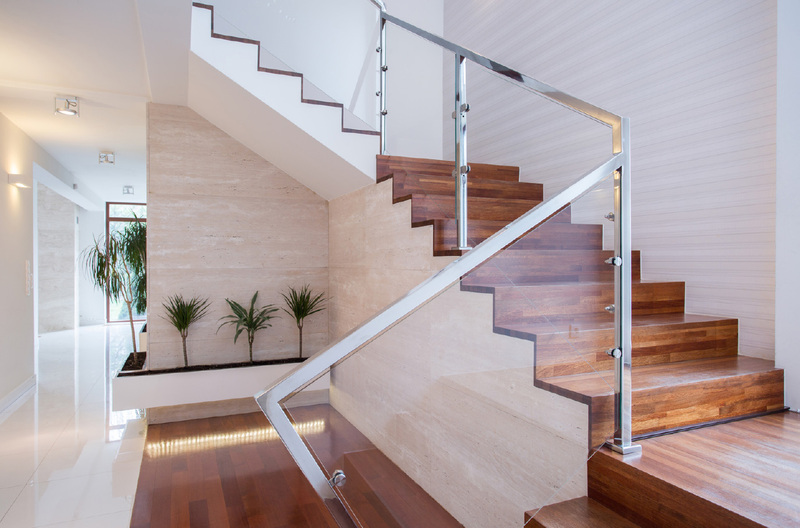 Give your home a modern feel by installing a glass railing on your indoor staircase. Nothing else is quite like the simplistic yet sophisticated charm of glass used to decorate your home’s interior. If you’re looking to increase your home’s value using glass railings, or are curious about glasses’ potential uses within your home, get in contact with us. In 1979, Ross Cairo started a small glass supply company, servicing the commercial industry. He quickly saw a need for a more diverse offering of products and eventually became a distributor of several lines of doors and windows to his customers. But the little company that grew was never just a supplier – they even maintained a high level of service by providing a full range of support from consultation to installation. A house that has glass railings is indeed very elegant and adds a luxurious atmosphere to a house. Worth recommending. Is There a Return on Investment to Adding a Porch Enclosure This Spring? When Is the Best Time of Year to Install Replacement Windows?